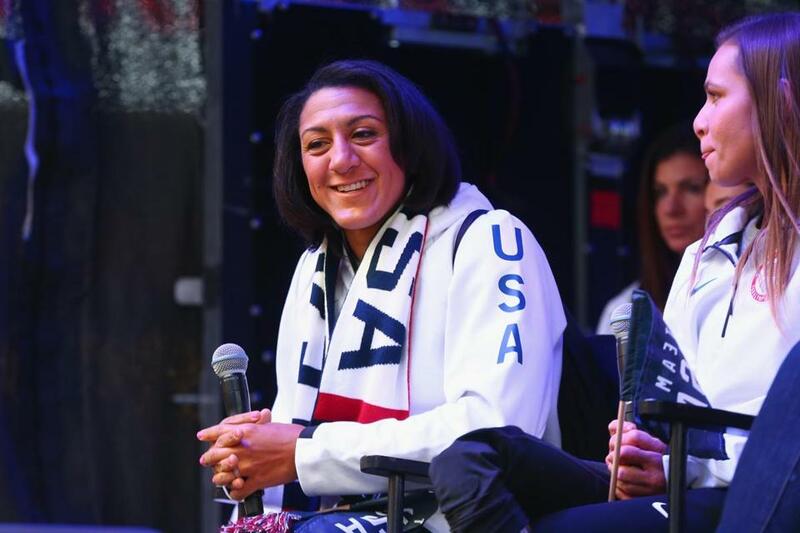 Elana Meyers Taylor appeared at the 100 Days Out 2018 PyeongChang Winter Olympics Celebration in New York in November. Editor’s Note: This story was updated after the 2018 Olympic team was announced. NEW YORK — It’s 100 days from the start of the 2018 PyeongChang Games and Elana Meyers Taylor is sitting in a chair on a stage in Times Square, a white, knit Team USA scarf draped around her neck. The two-time Olympic bobsledding medalist is joined on stage by four fellow Olympians for a question and answer session, with some 35 more standing behind them on mini-risers, all here for this glitzy United States Olympic Committee event. Meyers Taylor is asked by a moderator how bobsledding can inspire kids to pursue their Olympic dreams, and the pilot delivers a polished 141-word spiel. She explains that everyone has slid or rolled down a hill at some point in life, trying to go fast. She says that is the essence of bobsledding: get down the hill as fast as you can. And then the face of US women’s bobsledding with aspirations to one day run the USOC makes a pitch meant for the former college athlete unsure of her next move. She closes with the promise of brilliance in the sport on a global stage, three of her teammates — Aja Evans, Jamie Greubel Poser, and Lolo Jones — behind her as proof. 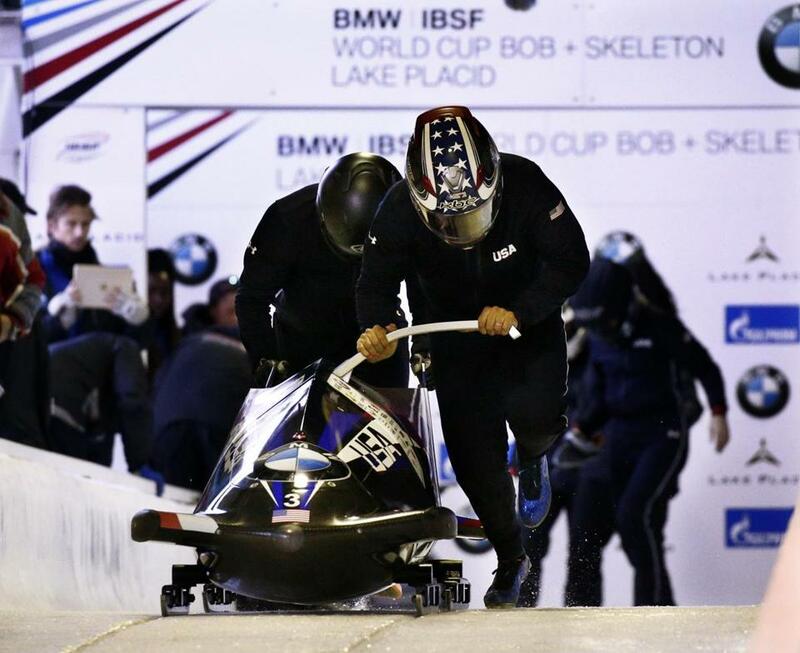 “So we really try and encourage kids to be active in a multitude of sports when they’re growing up and then come to us after college and we’ll convert you into the best bobsledders in the world,” Meyers Taylor says. From left, bobsledders Aja Evans, Jamie Greubel Poser, and Elana Meyers Taylor pose for a photo at a Team USA celebration in November. Women’s bobsledding made its Olympic debut in 2002, with Americans Vonetta Flowers and Jill Bakken claiming the gold medal, making Flowers the first black athlete to win gold at a Winter Games. When Meyers Taylor, who has made the 2018 US Olympic team, began competing with the national team five years later, she was the only woman of color. “Being in the field where you’re one of one in this whole field of faces that don’t look like you, it was really important to me to make sure that kids around the world — regardless of what they look like, regardless of where they come from — were able to see opportunities in this sport because there is opportunity for everyone,” she said. In an October interview with MadameNoire magazine, Meyers Taylor called the “explosion of African-Americans and women of color” competing in bobsledding “extraordinary.” For the US, seven of the nine athletes on the women’s bobsledding team this season are women of color. And Nigeria is sending a three-woman bobsledding team to PyeongChang, the first athletes to represent the country at a Winter Olympics. 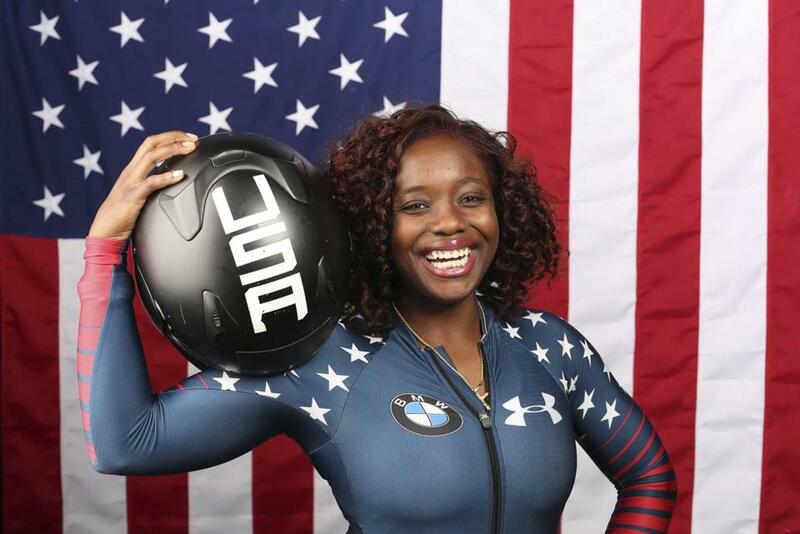 Evans, a Chicago native and a former five-time All-American shot putter for the University of Illinois, was introduced to bobsledding by her college coach and went on to win a bronze medal with pilot Greubel Poser at the 2014 Sochi Games, just two years after her first season with Team USA. This summer, Evans broke Meyers Taylor’s record en route to winning the push title at the USA Bobsled National Push Championships in Calgary, Alberta. This season, Evans has won a pair of World Cup silves with Greubel Poser. Meyers Taylor, 33, from Douglasville, Ga., began heavily recruiting when she became a pilot in 2010, helping bring in three of the nine athletes on this season’s team. She knows what kind of athletes she wants to recruit and where to watch them compete. She watches as much collegiate competition as she can: lacrosse, softball, volleyball, and especially track and field. “Most people watch a game because they’re excited about it; I’ll sit there and watch lacrosse championships to try to find a female who could be a bobsledder,” Meyers Taylor said in November. She looks for speed. She watches how the athletes move and how they adapt. She also researches coachability. And if an athlete catches her eye, she will find a way to make contact, via social media or through a coach. “I get laughed at a lot, but it still doesn’t stop me because I’m going to find the athletes I need to find,” Meyers Taylor said. Elana Meyers Taylor (right) and Briauna Jones trained ahead of a November World Cup event in Lake Placid, N.Y.
Kehri Jones and Lauren Gibbs were two of those athletes Meyers Taylor wanted to find, and along with pilot Brittany Reinbolt, they make up the trio on the national team that Meyers Taylor is responsible in some way for recruiting. Gibbs, a Denver native who played volleyball at Brown, was put onto bobsledding through a friend who also knows Meyers Taylor. Jill Potter, a 2016 rugby Olympian, informed Gibbs of an open tryout in 2014 and suggested she work with Meyers Taylor to get a feel for the sport. Gibbs did not think she had a legitimate shot at making the team. Four years later, Gibbs, a brakeman making her Olympic debut in PyeongChang, has 11 top-three World Cup finishes to her name, including two seconds this season with Meyers Taylor as her pilot. 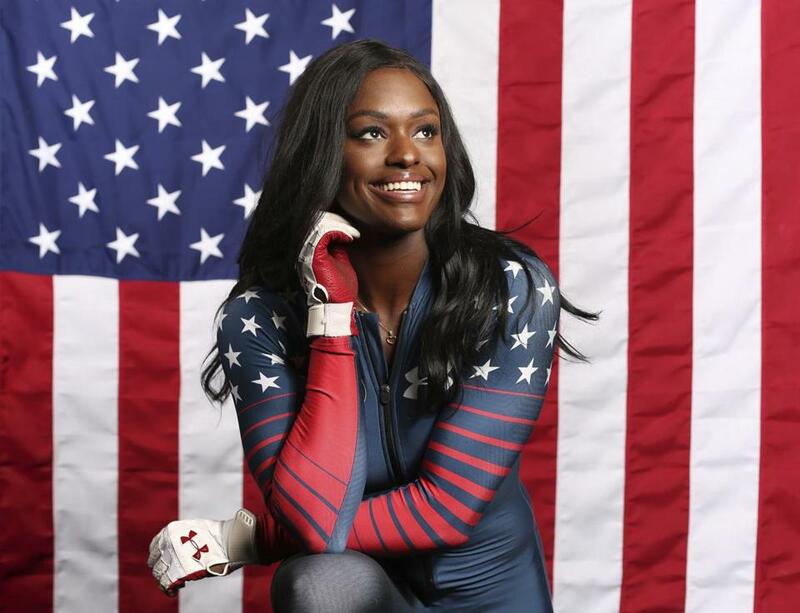 Jones, 24, watched Lauryn Williams, a three-time Olympic medalist as a sprinter, and Meyers Taylor capture the silver medal in the two-woman bobsled at the 2014 Sochi Games. Soon after those Games, Jones’s strength and conditioning coach at Baylor received an inquiry about the two-time All-Big 12 sprinter. It was an e-mail from Meyers Taylor. Eventually, Jones and Meyers Taylor captured the 2017 IBSF world championship, the second US world title in women’s bobsledding and the fifth straight year Meyers Taylor medaled at Worlds. 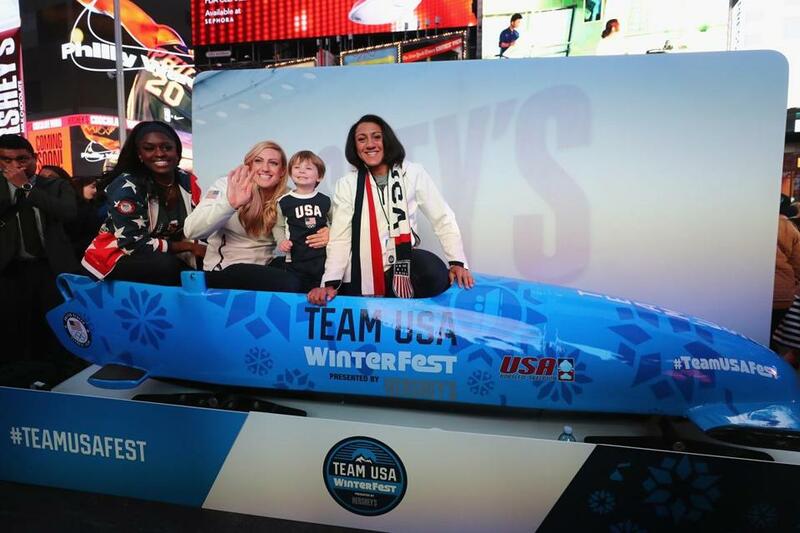 Kehri Jones was recruited to the US bobsled team by Elana Meyers Taylor. Rookies do not forget their first time down the bobsled run in Lake Placid, N.Y., Team USA’s home track. You don’t know what to expect. The transitions are fast. You hang on for dear life. You pray. Evans remembers the camera phones in her face when she finished her first run. She remembers thinking the sport was crazy. She remembers calling her mother, Sequocoria Mallory, questioning if bobsledding was right for her. Mallory promptly told her daughter to get back to the top of the hill and go again. Now, Jones has six top-three World Cup finishes since 2015. And Evans on Saturday was named to her second straight Olympic team with 13 top-three World Cup finishes since 2012, including four golds. Aja Evans is from Chicago.